Praise be to Allah, Lord of the Worlds, and prayers and peace be upon the most noble of Prophets and Messengers and upon his good and pure family and may Allah be pleased with His noble and blessed companions and those who follow them with good until the day of Judgment. 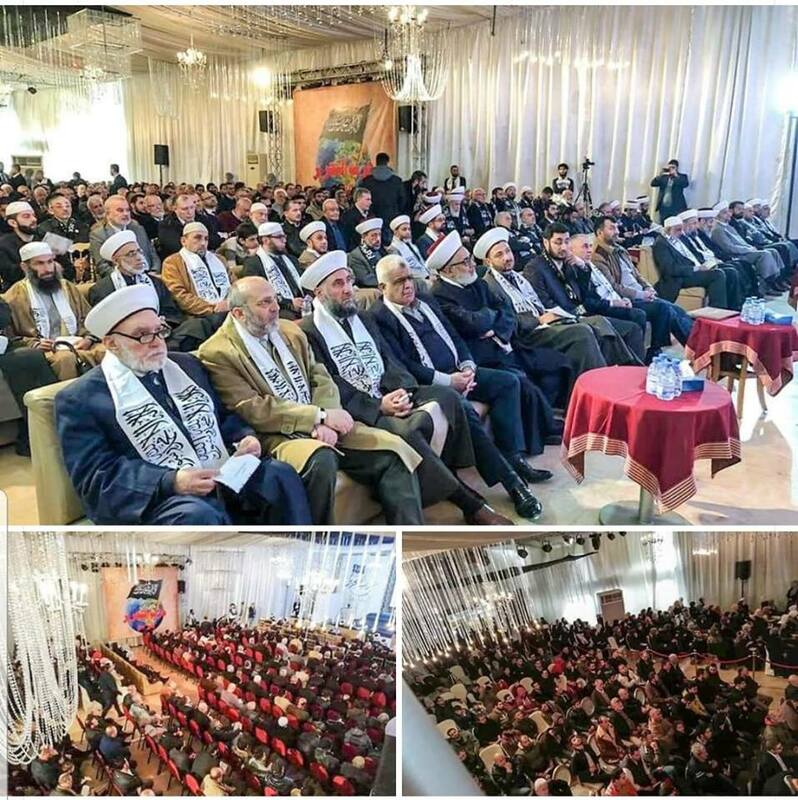 The conference held by Hizb ut Tahrir/ Wilayah of Lebanon on 24th Rajab al-Khair 1440 AH corresponding to 31/3/2019 CE, on the 98th anniversary of the destruction of the Khilafah (Caliphate); the Muslims’ protection, and the one that raises their banner; the state that looks after the affairs of the Muslims with the laws of Islam and carries Islam to the world with Dawah and Jihad. The Khilafah State, which was preserved by the Umara (rulers) and the Ulema (scholars) throughout the history of the Muslims, was the protector of the Muslims, and looked after their affairs with what Allah Almighty entrusted them with. Under its shade, ulema lived the period of juridical and scientific prosperity until Europe, its rulers and scholars, came knocking on the doors of the Khilafah and the caliphs to draw from the great reservoir of the Islamic State’s sciences. The state in which the ulema were shields of the truth, even at the expense of their own lives, and many of its rulers were acquaint with the words of the ulema, and valued their position and their power. Let the saying: “… There are two types of the people if they are righteous, people will be righteous, and if they are corrupt, people will corrupt: scholars and rulers”), became proved by the reality in which the Ummah is living today, under transgressing, defiantly disobedient and disbelieving regimes and sheikhs; and we do not say ulema because being a ‘alim (learned) is confined only to the one who fears Allah Almighty, in confirmation to the Almighty’s saying, who confined fearing Allah to the ulema: إِنَّمَا يَخْشَى اللَّهَ مِنْ عِبَادِهِ الْعُلَمَاءُ إِنَّ اللَّهَ عَزِيزٌ غَفُورٌ “Only those fear Allah, from among His servants, who have knowledge. Indeed, Allah is Exalted in Might and Forgiving” [Fatir: 28]. It is our firm conviction, us in Hizb ut Tahrir, of the important role of the ulema in guiding the Islamic street, and our recognition that the reality of this country, Lebanon, as it was in its history, a platform for attempts to alienate the Arab world, it must be today, a platform in the return of the Ummah to the Truth and rightfulness at the hands of its divine ulema, and its sincere workers of its sons, and we do not ascribe purity to anyone before Allah (swt). In addition, the wave of secularization is intensifying its campaign today against our region in an attempt to strike the idea of ​​Islam in general, and its access to power in particular, by what is known – by the leaders of this campaign – striking political Islam with the idea of ​​democracy, the offspring of secularism, and deceivingly portraying it as an electoral box, and not a system of life and governance. The campaign has even intensified so that it wants to strike the remainder of the provisions of Islam, in family and personal status, so that the bid’ah (innovation) of civil marriage, attacking inheritance, and homosexuality complement the old campaign of personal freedoms and calls for equality between women and men. Thus, these new innovations – as it is said – added fuel to the fire in addition to what is heard of the return of some of the atmosphere of atheism, especially among the youth in universities, because of the absence of the role of Muslims who are working in refuting arguments with arguments and responses that convince the mind, agree with the instinct, and fill the heart with tranquility. The first theme: Secularism from Europe to the Islamic world. The second theme: Islam and the ulema in the face of secularism. The third theme: the Ummah and the critical moment. First, a pure and clear view in stripping secularism, unfolding its true description, and the fact that besides it being unsuitable for mankind, it is not suitable for the Ummah of Islam, which carries a religion from the Subtle, the Acquainted. Then, a pure and clear view of the meaning of the primary role of those who have knowledge, and their maintenance of justice, in the preservation of the Islamic identity, and the fact that Almighty has chosen them among His servants to be of the foremost in good deeds, Allah willing, and that is the great bounty. And then they become like the ones who preceded them from the ulema of the Ummah, who Allah raised high their repute and mentioned their names on every tongue to the Day of Resurrection, that is for what they believed, learned, and did. Thus, they deserved, and you deserved – by the bounty of Allah and His permission – the saying of the Almighty: يَرْفَعِ اللَّهُ الَّذِينَ آمَنُوا مِنكُمْ وَالَّذِينَ أُوتُوا الْعِلْمَ دَرَجَاتٍ “Allah will raise those who have believed among you and those who were given knowledge, by degrees”. [Al-Mujadila: 11]. Finally, and not least, we shed light on a clear and pure view in explaining the work of the Ummah at this critical historical moment with what is in its hands of the media and the alternative media through electronic means of communication, until the magic turns on the magician, with the permission of Allah. … And we demonstrate that despite what is seen of mightiness of this secularism, it is a civilization that is becoming extinct; it kills itself; its societies aged and became prevailed by a massive tide of Muslims, who whenever the West seeks to integrate them, someone comes to awaken them to the fact of their distinctiveness due to their religion until Allah causes whom He wills of His servants to inherit the earth and whoever is on it in the Islamic state, Khilafah on the method of the Prophethood; the alternative for Western civilization, a shield and a protection from behind whom one would fight, and by whom one would protect oneself. A state in which no ethnical cleansing, no racial discrimination or minorities are heard of, but they are citizens and the people of Dhimmah. First: the need for the ulema to take their real role, based on the fear of Allah Almighty primarily, and then taking the interests of the Ummah on their shoulders, in practice, and not only with knowledge. Second: The need for the ulema to stand together with their working sons of the Ummah, so that they become their support, reference and their defender, especially with the intensification of the ordeal, and the absence of the support, the reference and the defender. Third: To begin to consider how to counter the attack by the sheikhs of the sultan through platforms and satellite channels, and to invest the energies of youths in this field, especially in the means of electronic communication, which has become an effective alternative media, which have even managed to lead the whole movement of the people of the country. Fourth: The leadership of the ulema and the sheiks of the present scene, and the need to show that there is no exaggeration or moderation in Islam. Exaggeration that has become the equivalent of slaughter and murder, and moderation which became the counterpart of compromising, realism and utilitarianism. Rather, we are the nation of “Wasat”, not translated as the middle, but the Wasat of something means the best of it, as confirmed by the word of our Lord Almighty: وَكَذَٰلِكَ جَعَلْنَاكُمْ أُمَّةً وَسَطاً لِّتَكُونُوا شُهَدَاءَ عَلَى النَّاسِ وَيَكُونَ الرَّسُولُ عَلَيْكُمْ شَهِيداً “And thus we have made you a just nation that you will be witnesses over the people and the Messenger will be a witness over you.” [Al-Baqara: 143]. Fifth: Beware of secularism which encases itself with Islam or knowledge; both are a danger suffered by the Ummah in its movements, and it continues to suffer, where the rulers take them as a concealment to contain the Muslims. Sixth: Not to separate from the Ummah in its movement, but lead and direct it, so that the ulema are not preceded by the Ummah and its movements in the sacrifice and action, and the wave of the Ummah is ridden by the secularists, who are supported by the Western kafir colonizers, through different names to disguise the Ummah. Seventh and last: The conference should be a nucleus for the meetings of the ulema and periodic workshops that discuss the developments and movement of the Ummah and the attempts to conspire against it, and a transformation to the practical and applied aspects of such conferences through expressing the problems and the interests of the Ummah and not only to be sufficient in the academic and knowledge aspect. At the end of this conference, we in Hizb ut Tahrir in Wilayah of Lebanon would like to express our sincere thanks and appreciation to all who answered our invitation from distinguished ulema and Sheikhs, and the distinguished audiences, may Allah bless you and your efforts. Our thanks are to all those who helped organize this conference, the elders and the youth, especially the brothers in the Central Media Office of Hizb ut Tahrir and Al-Waqiyah Channel. We ask Allah (swt) that the office and the channel be nuclei of work on the level of the coming State of Islam, the Khilafah on the method of the Prophethood, with the permission of Allah. And we ask Allah (swt) to make it in the scale of their good deeds on the day that no money or sons will benefit, but only the one who meets Allah with a sincere heart benefits. We ask Allah to grant us, you, and the Muslim Ummah, His (swt) victory soon, and lift the hardship soon, this is easy for Allah to accomplish. Indeed, Allah will accomplish His purpose. Allah has already set for everything a decreed extent. Praise be to Allah, who with His grace and virtue and generosity are good deeds fulfilled. And we ask Allah (swt) to lift the hardship soon, and that the upcoming conferences to be in the land of succession to authority, empowerment and security. This is easy for Allah to accomplish. Indeed, Allah will accomplish His purpose. Allah has already set for everything a decreed extent. Next PostPakistan’s Leadership is Running the Economy into the Ground, Whilst Giving False Hope of Recovery!